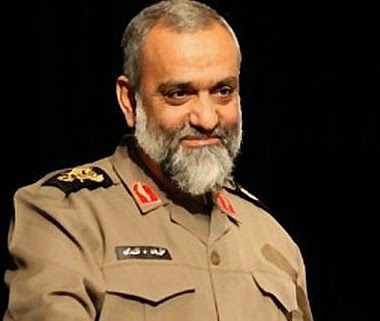 With the attention of most of the news-reporting industry focused on Lausanne and the marathon efforts to negotiate a nuclear Iran agreement, the name of Brigadier General Mohammad Reza Naqdi is not the one on most people's lips. Perhaps it ought to be. Naqdi, actually an Iraqi with Iranian "origins" with a penchant for practising self-torture, is the commander of the Islamic Republic of Iran's Sâzmân-e Basij-e Mostaz'afin ("The Organization for Mobilization of the Oppressed"), usually described as a 'paramilitary' force. If people know of it at all, it's may be under the name Basij. The daytime protests across the Islamic republic have been largely peaceful. But Iranians shudder at the violence unleashed in their cities at night, with the shadowy vigilantes known as Basijis beating, looting and sometimes gunning down protesters they tracked during the day... [T]he Basijis lack uniforms, proper identification or anything that denotes them as public employees [and appear] with hoses, clubs, iron bars, truncheons and sometimes firearms. At a time when the true motivations of Iran's leadership are at the heart of serious global controversy with existential consequences, Naqdi and his views appear to be getting kid gloves treatment - not so much here in Israel, for obvious reasons. Times of Israel is one of a handful of English-language news sources which picked up the contents of a Naqdi speech, first reported by Israel Radio this week, made at the precise moment when Iran's negotiators are busy in Swiss conference rooms selling the notion that their country's vast investment in nuclear research and development, much of conducted underground, is a matter that ought to be perfectly understandable and nothing to worry about. Give the man credit for eschewing the genteel double-talk of his political superiors. What's on his mind, in plain Persian, is "erasing Israel off the map". Iran's Fars news agency and the Lebanese media (who know something about Iran's close attentions) refer to his blood-curdling threats [here] this week against the Saudis and the Americans (and not for the first time). But neither they, nor any other mainstream news source as far as we can tell, report on what he says about Israel. Doubtless an oversight. Israel could suffer hundreds of civilian dead and damage to its vital infrastructure from Hezbollah rockets if it fights another war with the Iranian-backed Lebanese guerrilla group, according to Israeli military assessments. The scenario, published by Israeli media on Wednesday, reflected concern among security planners that since the last Lebanon war, in 2006, Hezbollah has expanded its rocket arsenal and gained battle experience helping Damascus fight the insurgency in Syria... According to the military assessments, between 1,000 and 1,500 rockets could hit Israel daily in the next full-blown conflict, killing hundreds of people and potentially paralyzing key installations like airports, sea ports and power stations. Far from the negotiating teams, from the luxurious Swiss restaurants and from the vague/optimistic press releases, the reality of an aggressive, ascendant armed-to-the-teeth Iran incubating a nuclear arsenal while sneering ["As crowd chants 'Death to America,' Khamenei backs nuclear talks"] at those who claim to be curbing them has a chilling, concrete edge for Israelis. Not so much for Americans. By a nearly 2 to 1 margin, Americans support the notion of striking a deal with Iran that restricts the nation’s nuclear program in exchange for loosening sanctions, a new Washington Post-ABC News poll finds. But the survey — released hours before Tuesday’s negotiating deadline — also finds few Americans are hopeful that such an agreement will be effective. ["Poll: Clear majority supports nuclear deal with Iran", Washington Post March 30, 2015]. You have to admire that kind of never-mind-the-facts optimism. Just where it comes from might get clearer in the future. Right now, from where we sit, it's awfully puzzling.